I am really excited to share this news today. My tumor has responded positively in the right direction. 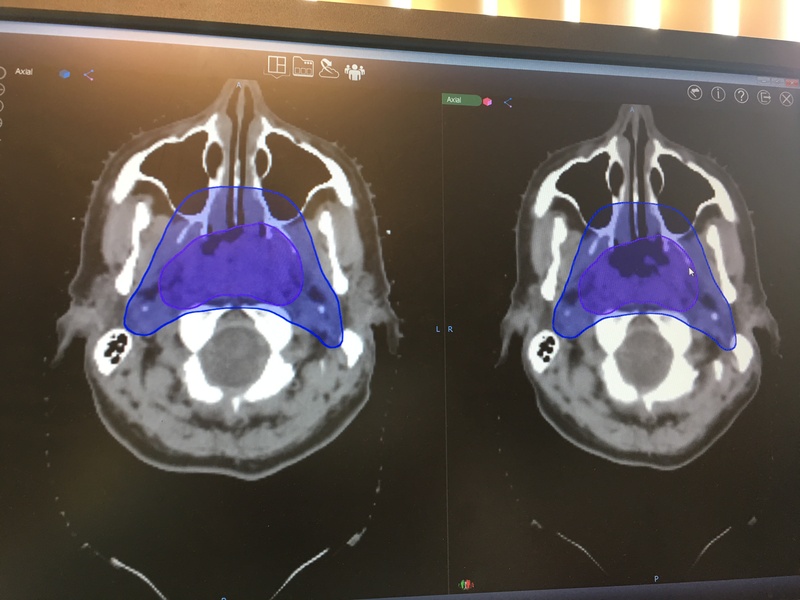 The image on the left, shows a CT scan taken November 9, 2016 before treatment began. 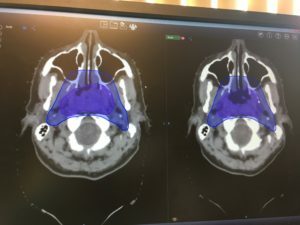 The purple area displays a white clouded area known as Nasopharyngeal Carcinoma. The black area signifies the air passage ways. Now take a look at the CT scan on the right taken today. The white clouded area has started to diminish. The black area shows an improvement of the air passage way. This means the tumor has responded and has started to shrink. The Anderson’s are smiling BIG today! THAT IS AWESOME NEWS. Shared with my sens group on fb and my own personal page. Keep on fighting – we pray and stand with you. So happy for you Nic!!!! Keep fighting and being strong thoughts to you and Craig and the boys!!! Such wonderful news! Continued prayers! Amazing news!!!!!!!! Keep fighting strong…. Just a random guy in Vancouver going through similar treatment. Wishing u the best. What wonderful news! We are so very happy to hear the good news! We love you honey!! Sooooo happy to read this!!! Keeping you in our prayer! Oh my gosh….super great news…..God is listening to all our prayers! That is wonderful news Nik. This is wonderful news! Continued prayers for you and your family! Really happy to see your good news today. ! Keep up he fight it will soon be a memory !!! Praise Jesus for this good news🙏 Keep it going ! Great news! Keep on fighting; we’re all standing right behind you. Such great news, my prayers are being answered. God Bless and I will continue to pray for you! We are so glad to hear the great news! We hope for continued progress! This is great news! And it will keep on shrinking…I just know it! Yay, wonderful news!! I’m cheering for you all the way 😉 Hugs!! Our thoughts and prayers are being answered! That is awesome news today. We don’t know each other but I am a recent cancer patient in remission and I didn’t know if I was going to see another Christmas. Faith and willingness along with friends and family got me through this so that I could see another Christmas and many more. My thought and prayers are with you and Craig. YOU WILL BE SMILLING A LOT MORE SHORTLY. God bless and Merry Christmas to you and your family. That’s amazing news. Congrats to her. All the best to you and to your family! Am wondering if Craig has needed to contact someone (in hockey) who has been through a similar situation so as to get some hockey-husband support? If he hasn’t already, it would be Dominic Moore and Darryl Sittler…..
God Bless you Nicholle and Craig i am so very happy for you both . very positive at all times . Wishing you the best . So happy for you and your family. Keep fighting.!!! Sending all positive thoughts your way. I hope you continue to destroy this, ive always been a huge senators fan but now I’m a fan of yours following this journey hoping that things keep moving in the right direction. Stay strong!! Positive thoughts from oromocto new Brunswick! This is the best news yet. Prayers have been answered. Enjoy the Christmas season and keep up the fight. Congratulations! I am a firm believer in prayer and positive thoughts (and also laughter) so keep strong, keep positive, and try to find something to laugh about every day! God Bless you and your family! Brings tears of joy for you. Bless you and your family through this journey! Hi Nicholle, Fabulous news on the eve of the holidays! I am a heart valve replacement survivor so I understand to some extent the struggle. I have been blessed to have a support system to help me maintain the strength and positivity needed to get beyond the difficult days. You seem to be blessed to have that as well, with Craig and family. Excellent news. Thank you for sharing your private life. You can help somebody have hope. Wonderful and encouraging news… Prayers in numbers bring positive results.. You Go Girl!!!! Stay strong and kill that f#%#ing cancer. Thank you for sharing your journey with us… Thoughts and prayers are with you and your family. You will beat this. Hugs!!!! I just shed tears of joy for you! You continue to be in my daily thoughts and prayers! Thanks terrific news! I’m so glad to hear you are responding well to treatment. Praying for continued positive health reports for you. Congrats. We say a prayer for your family every day. Hopefully it keeps going in the right direction! Hang tough. Wonderful to hear this great news! Wishing you all the best. So, so happy for you and your family !! I have known your Aunt Marie and Neil and Talina for 35 yrs and they have talked about you for years. My prayers are with you and I think of you at least 3 times a week because they are so important to me. Stay strong and fight with all you have. Superior thinking detseomratnd above. Thanks! Soooooo happy for you!!! A great improvement in a short amount of time! Keep up that positive attitude, it really does help. Amazing news! Loving the progress so quickly, stay strong! Stay positive! We will keep praying for you sweetie! That’s the kind of news we like to hear! This is wonderful news!!! My youngest son and I pray everyday for you! I can wait to sh0w him this in the morning! Wonderful news! Constant prayers for you, Craig and your boys. Keep fighting! My husband and I are huge SENS fans, so proud of our boys! But our boys are only as strong as the women behind them and you my dear are one of the strongest I’ve seen! This is wonderful news and I know you and Craig will be fighting this all the way to success…many prayers and thoughts go with you. Here’s some hugs from our family to you and yours! Thankful for your great news. May God continue to be with you and grant continued success in your treatments. So excited to see how God’s healing hand is at work. We are praying for you continuously and hope you feel the love! !AWSOME STUFF ! KEEP STRONG ! This has been a long awaited Gift from God. Nobody knows better than You & Craig the impact this trial of yours has had upon everyone. There is a unification of all Hockey players world wide ++ every fan has been pulling for you. We all have put aside our differences to unite in mighty prayer for a safe and healthy fresh start for your immediate family. Best wishes for a Happy Christmas & a Joyous New Year !!! Such a Gift from the only person who really could perform this miracle for you, Jesus Christ !! Thanks for your thgohuts. It’s helped me a lot. Wishing you all the best and sincere thanks for sharing your journey to wellness! Wonderful news Nicolle, we are all praying for you and your family. Nichole and Craig we are very excited to hear this news!! We’re continuing to pray for you guys!! Great news! You and Craig are in my thoughts always. Amazing news, Nicholle! That is such a positive development and must be so great before Christmas. Here’s to more great progress like that in 2017! Merry Christmas!!! So wonderful to hear this news!!! Your positive attitude is an inspiration.